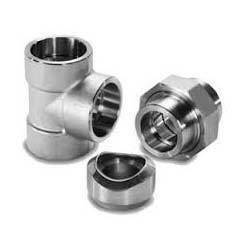 We are determined to provide a superior quality range of Socket Weld Pipe Fitting. The offered fitting is used for fastening purpose in different industries. Our offered fitting is procured from authentic vendors of the market who are commended for their product quality since many years. Further, it is checked for its quality on series of quality parameters before being supplied to our clients. Clients can avail this fitting from us at affordable rate. Incorporated in the year 2006, we “Vivis Alloys”, are the prominent trader and supplier of supreme grade Stainless Steel Metal, Carbon Steel Metal, Alloy Steel Metal, Non Ferrous Metal and Pipe Fittings. These products are procured from trusted vendors of the market who are known for their product quality and timely delivery. These products find their application in various industries for various purposes. The offered products are made available in different specifications of sizes, shapes and dimensions to meet vast necessities of our clients in specified manner. Further, these products are checked on different stages of quality parameters by our quality controllers. Our offered products are widely appreciated by our clients for their features easy installation, corrosion resistance, light weight, anti corrosive, abrasion resistance and durability.